This column, and many like it, are featured in every issue of Card Player magazine. Subscribe today to get 26 issues delivered to your home each year! Swedish poker pro Anton Wigg has been successful in online cash games and multitable tournaments for more than three years, and in that time span he has developed a knack for managing a bankroll designed to play two dynamically different spheres of the game. Despite being best known for his win at the 2010 European Poker Tour Copenhagen main event for $670,713, the 23-year-old Wigg is a regular at €5-€5 to €10-€10 pot-limit Omaha on European poker sites. When not grinding the middle stakes cash games online, Wigg has found time to mass nearly $2 million in career tournament earnings, thanks to victories in a PokerStars Sunday Million and the 2009 European Masters of Poker Barcelona main event, in addition to his seven EPT cashes. Card Player caught up with Wigg to talk about his start in poker, the differences in bankroll management for tournaments and cash games, how one is able to successfully juggle both, as well as his thoughts on the stereotype of Scandinavian players being hyper-aggressive. Brian Pempus: How did you get started in poker? Describe your progression up the stakes. Anton Wigg: I started by playing some freerolls with friends from my football team. Most of the time, I was the one who ended up having the best results. I used the money I won and played cash games with mixed results. Since I was under 18 at the time there was no way I was ever going to get any money from the account. But playing for real money was way more exciting in so many ways. It was so different from play money tables and freerolls where people didn’t care that much for the game. When I turned 18 I put about €50 into an account and started grinding low stakes five-max cash games. I did really well there almost immediately. One thing that helped a lot too was that early on I won a €50 multitable tournament for €2,500. The second part of my travel up the stakes, after my fast start, was when I grinded at €0.50-€1for quite some time and played with sounder bankroll management than I had before. After grinding these stakes for a few months, I finally managed to take a couple of successful shots at higher limits. After that my bankroll was big enough to start playing them more regularly. At the time, at the site I was playing on, €5-€10 was pretty much the highest game that was running regularly. So I felt like I was close to the top of the hill, and that got me even more motivated. I was playing a lot and did pretty well at €2.50-€5. After some time I stepped up to €5-€10, and I did OK there. Playing €5-€10 was more to satisfy my ego, which at the time was pretty big. BP: Can you talk about how your big tournament score at EPT Copenhagen affected your cash game play? Did you move up in stakes as a result? What advice would you give to players who have a large tournament score, relative to their bankroll, and want to jump into the cash games afterwards? AW: I had a pretty big bankroll at the time I won EPT Copenhagen, and I was focusing a lot on tournaments so it didn’t change my cash game play much. But when I did sit down at a cash game it was a bit higher limit than before. However, later on I had a big bankroll and was able to explore other games, and that’s how I got into pot-limit Omaha. For advice, I would say don’t go crazy and play a lot higher than you usually do. It takes time to adapt to higher games and that shouldn’t be rushed. With that being said, I would take some shots at higher limits every once in a while to learn and come better prepared when it’s time to move up. BP: How does cash game play help prepare you for tournament poker? Would you advise any new player to get experience in cash games in order to improve his/her tournament play? AW: Cash games are a great way to practice early level play in tournaments where you are deep stacked. This especially applies for live tournaments with good, deep structures. Also, today there are many cap and shallow cash games running, which could help make the transition to the later stages of a tournament, where you are usually pretty shallow. BP: Can you talk about bankroll management in poker? Can you give some advice for beginning players on this area of poker? What are the differences in bankroll management for grinding tournaments versus grinding cash games? Do you need more buy-ins available if you play tournaments? AW: Bankroll management is, apart from learning how the game works, the single most important thing you must learn if you want to be a successful player over a long period of time — assuming you don’t get very lucky over and over again. I’m not saying that I’m a saint when it comes to bankroll management, but I’m proud that I’ve moved down in stakes several times because my bankroll got smaller, and I couldn’t stand playing the stakes I was at. The differences between a cash game bankroll and a multitable tournament bankroll are big. I won’t get into numbers since you’ve probably heard it so many times by now. However, what I can add is that you should understand the variance in the game you’re playing. Multitable tournaments can be brutal since you have plenty of days where you don’t have a big score, and yet a couple of big days might turn a month from a big loss into a huge profit. No-limit hold’em cash games are more like grinding and trying to have a stable curve upwards, where you might swing several buy-ins up and down. But if you’re a winning player at the limit you’re at you will see that your winnings curve will slowly rise upwards without major downswings. Pot-limit Omaha cash, on the other hand, will be a roller coaster, with many ups and downs and huge swings in both directions. It’s all about the nature of the specific game, and you have to be prepared if you want to take your play seriously. BP: Do you have a separate bankroll for tournaments and cash games? How do you keep track of your results when playing both? When you play online, do you ever have tournament tables and cash game tables up at the same time? Is it hard to concentrate on both simultaneously? Should beginners just play one type at a time? AW: I do have separate bankrolls. Today I use different accounts on the European sites that allow it for tournaments and cash games. When I play on sites that only allow one account I just make a note of what my bankroll was when I started the session and keep a log of my results in a document. I rarely play both simultaneously since I usually have so many tables up when playing multitable tournaments that I can’t focus on pot-limit Omaha cash at the same time. Playing no-limit hold’em cash when playing a few tables is better since you’re playing the same game, only with different blinds and stack sizes. But this isn’t something I would recommend for beginners. You should focus on the game you’re playing and only that type. BP: What makes Scandinavian poker players so aggressive and fearless? Is this a myth or is there truth to this assumption? Can you talk about what might contribute to this? What kind of style do you implement in cash games? What kind of style of play would you advise amateur players to adopt? AW: Well it is part myth, part true. Swedish players are very aggressive since playing aggressive is the right way to play most of the time. Most of the really good Swedish players today are very smart and educated people who understand the benefits of taking aggressive lines. I also believe that a lot of it has to do with the creativity that is a big part of Swedish educational system, where it’s being rewarded if done well. 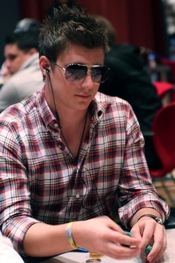 My basic style is loose-aggressive, which began when I started playing cash games with pretty weak players. The style got rewarded, and that stuck a little bit. But I don’t like to label myself. I try to take the information given and use it the best way possible every hand, and my game has come a long way since back then. For beginning players I would say play tight-aggressive. Lower limit games are so loose-passive that there’s not very much room to bluff a lot. But that doesn’t mean you can’t semi-bluff and put pressure on people.